Special Containment Procedures: SCP-1459 must be contained in a 1 cubic meter cell of iron with a shell of maxi glass and space of 5 centimeters between. Any suspicions of any person or object effected with SCP- 1459 must be removed from facility or terminated by Class D personnel immediately. 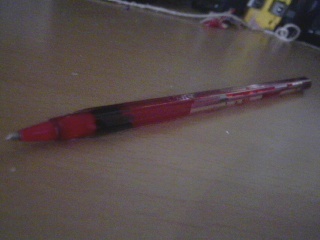 Description: SCP- 1459 is a red ink pen. But when first came across it, we found that it is actually human blood. SCP- 1459 can't write but any people or objects who made contact with SCP- 1459 will suffer and die from massive blood loss. Objects contacted with SCP- 1459 are contagious as well. SCP- 1459's "ink" gets a higher capacity for every victim. Agent ██████ dies in ██/██/██ from major blood loss.